Amino AcidsAmix Amino Pills - 660 tabl. 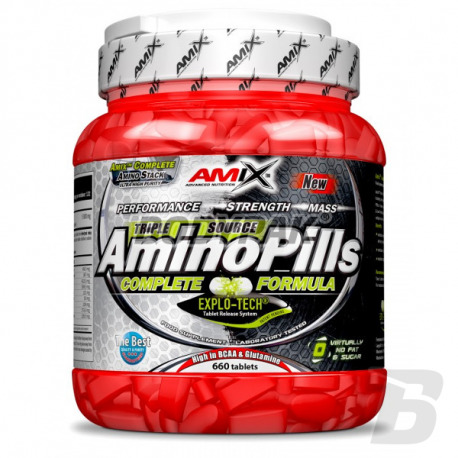 Amix Amino Pills - 660 tabl. Amix ™ Amino Pills is a modern complex amino acid complex, which is an ideal source as a compliment of amino acids in the body during intense training and diet, due to the very low content of fat and sugar. 149 loyalty points Your cart will total 149 points that can be converted into a voucher of 5,96 PLN. 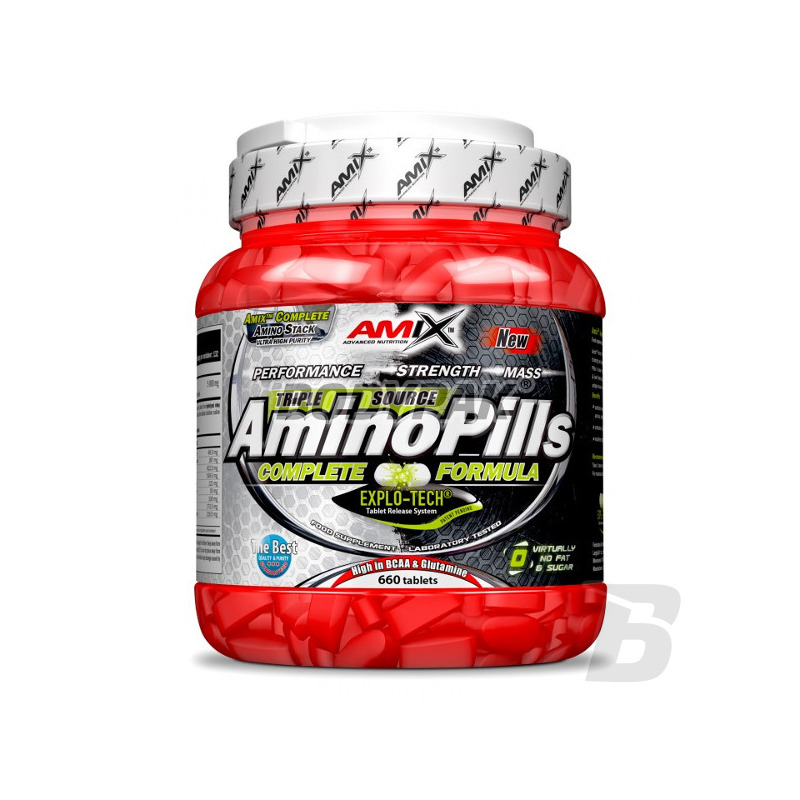 Amix Amino Pills - 330 tabl. AmixTM Amino Pills is a new amino acid supplement ideal for periods of intense training and dieting, because of very low fat and sugar content. AmixTM Amino Pills is based on an unique Triple source amino complex composed of whey and beef hydrolyzate and soy protein isolate. Therefore it can supply to body an unique balance of high quality amino acids. Serving Size : 5 tabl. Ingredients: amino acids derived from hydrolyzed beef protein and whey, soy protein isolate, microcrystalline cellulose, silicon dioxide, magnesium stearate. Dla mnie dobre rozwiązanie są tabletki, które mogę w dowolnej chwili zażyć. Ten produkt dostaje ode mnie ocenę 5/5. Polecam. Dobra cena, działanie oceniam na bardzo dobre i odczuwalne. Lepsza jakość budowanej masy mięśniowej. Bardzo dobry produkt, cena nawet w normie - generalnie świetne aminki po treningu. Swanson AjiPure L-Cysteine 500mg - 30 kaps. The highest quality pure pharmaceutical cysteine. Cysteine is a powerful anti-oxidant, and a substance that detoxifies the body and stimulates the immune system. L-cysteine supplements the daily diet with the elements necessary for proper design and operation of part of the cartilage - basic skeleton. The product contains high quality L-arginine, an amino acid involved in the synthesis of DNA and contributes to a positive nitrogen balance. Highest quality! UNS L-Arginine & L-Ornithine - 90 tabl. Top-quality formulation containing L-arginine in a highly bio-available form. Top-quality precursor of nitric oxide (NO), creatine, ornithine and agmatine. Apply this supplement and you will understand what it means true and breaking muscle pump! BioTech Beef Amino - 120 tabl. High-quality bodybuilding supplement amino acid is based on beef protein isolate and an extract of bovine liver Argentine. Amino acid supplement of Biotech USA Beef Amino lactose! High-quality l-arginine in the form of easy to swallow capsules! Improve your pump on training! Increased capacity of the blood vessels effect of better nutrition and oxygenation of body cells, so there is a faster recovery and growth of muscle mass! Amix Amino HYDRO-32 - 250 tabl. Very easily digestible amino acids with the process of hydrolysis. If you are looking for high-end product, the use of which will not only help replenish protein in the diet - this supplement will give up almost perfectly for this purpose. High-quality booster NO, the composition of which is based not only on a solid dose of AAKG, but also the addition of magnesium! Each serving provides maximum support pump training, through which your motivation soar up! Refined taste definitely you will fall to your taste. Thanks to liquid form greatly improved digestibility and speed.